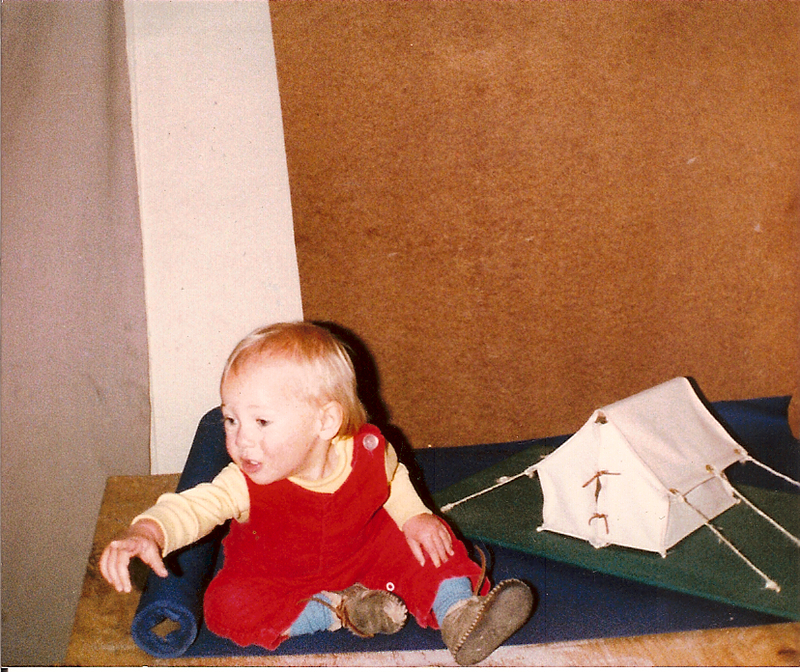 Tiny me in my dad's shop circa 1982, with a model tent. Eating lunch in Long Valley Canvas in the 80's. Making a trunk bag at Langlitz circa 2010. 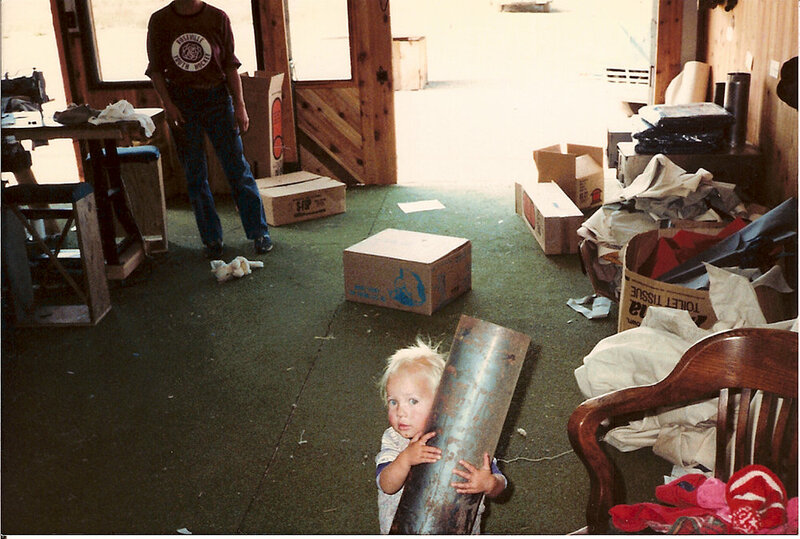 It all started in my dads canvas shop, Long Valley Canvas. I can still smell the rolls of canvas and sewing machine oil, and hear the hum of industrial machines. I was just a tiny tot when he started the shop, but I spent many hours there, getting into trouble and sleeping under the machines. I'll always remember those times. My dad worked a lot, but not so much that he couldn't enjoy life with his family. We always went on adventures, partially so he could field test his designs, but his nickname was Mountain Mike, so....that's where he loved to be! With the help of my mom, he learned all he could about sewing and making boat covers, bags, awnings and tents. It was never easy, and we were never rich, but we were happy. These experiences are what inspired me to live the same type of life. Since I was very young, I have supported myself with sewing. I've sewn everything from wedding dresses and lingerie, to heavy duty bags, leather jackets and finally motorcycle seats and accessories. In 2009, I moved back up to Portland from a 5 year stint in California, and right away I landed a job at Langlitz Leathers. For two years I made motorcycle jackets, pants and vests, along with various custom items. 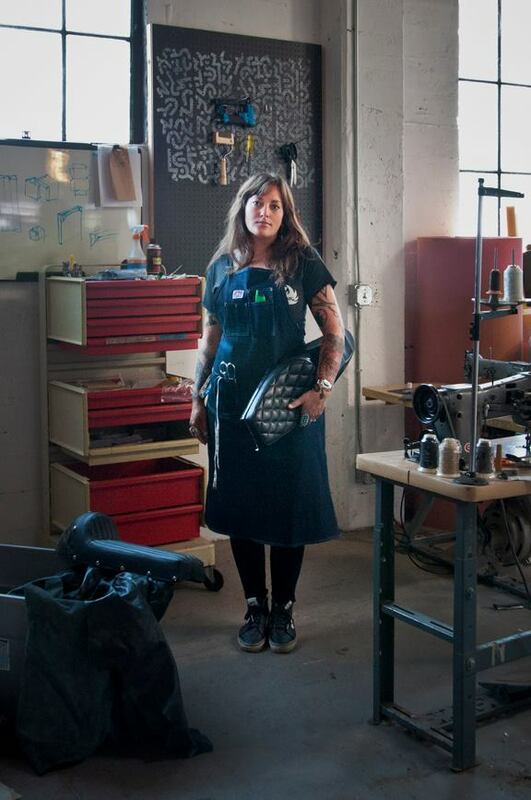 It was an amazing experience and I became very comfortable with sewing leather. But, the mountains were calling and I knew that I had to do something on my own, make my mark on this world. I took out the $1200 I had accumulated in my IRA account from Langlitz and bought my own Juki. I had been doing a few motorcycle seats on the side after clocking out for friends and after doing the math I realized that I was making just enough money to pay my bills so I bid farewell to the Langlitz family and started out in my dusty garage. Going into this it was never my intention to make a lot of money, I just wanted to be happy creating things under my name and having the freedom to travel and create a foundation for my future family, much like my dad had done. Over the past 8 years, New Church Moto has grown bigger than I ever imagined it would, and has made it possible for me to feed my family, as well as given me the freedom that I need to feel alive. We are working on developing a new line of bags that pay homage to my dad's legacy. We introduced the first run of bags in 2017 and will continue to create many more! Thanks for all your support, it means the world to me and my family.